Everything in the tech and digital marketing space moves at lightning speed and website design trends for small businesses are no exception! It can sometimes seem like a full time job keeping your website’s design up to date. Some trends come and go, but others are definitely here to stay. 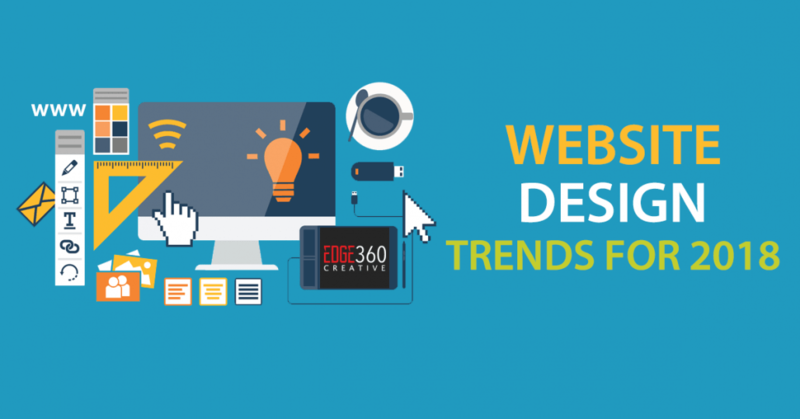 We’ve covered three key website design trends that you should stay on top of this year to stay ahead of the competition. You should pay close attention to how you can use new features to improve the stickiness of your website design. Stickiness is a term that refers to techniques that that you can employ to encourage visitors to stay on your website. If you can keep them on your website, they’ll continue to browse your content and are more likely to fulfill your call to action. Although stickiness is not a new concept, new trends have emerged that show off your best content and keep your visitors on your site longer. Video is now an essential part of any offering, whether it be to show demonstrations, product or service reviews, or even calls to action. Videos are perfect for conveying your message with added personality and provide the perfect opportunity to showcase what your brand is about. People are also more likely to stop and view or interact with a video as opposed to paragraphs of copy, which increases engagement and conversions. Fixed navigation bars are also here to stay. For site visitors, it can be a real pain when you scroll down the page to consume the content and lose the navigation bar. By fixing the navigation bar to the top of the browser as we’ve done on our website, you can ensure that your visitors are always one click away from browsing your other content and engaging with your call to action. Without a fixed navigation bar, the user then has to scroll to the top of the page to access additional menu items. This one simple change could be the difference between a lead or the visitor leaving your website. In 2018, you have absolutely no excuse for neglecting mobile visitors. Increasingly, many of your customers and potential clients are browsing your website on mobil devices. If your website design isn’t intuitive on mobile, people will leave quickly and you will lose conversion opportunities. Think of it this way; if your images are the wrong size for a mobile screen or your website isn’t loading properly but your competitor’s looks and feels like a native app, then you lose potential customers and they will be unlikely to return to your website any time soon. When you have put a lot of effort into creating your business, designing your website and writing copy, don’t do yourself an injustice by not optimizing it for mobile users. Even simple things like putting sharing buttons in places where the visitor can clearly see them make a difference. Sharing via social media is so natural on mobile, so you should make it extremely convenient to do so. Naturally, the more your website is shared, the more traffic and the more potential sales you can generate. Although not mainstream yet, this is certainly a trend you’ll see more of throughout 2018. Artificial Intelligence might seem incredibly complicated and only relevant to large tech companies like Tesla and Amazon, but they can benefit your website and business in the form of chatbots. A chatbot is a program designed to simulate conversation with your website’s visitors. A chatbot on your website can provide a route of communication for the customer to ask questions instead of having a Frequently Asked Questions (FAQs) section. Using the keywords within the question, the chatbot can then provide information from a database of answers to questions. If the visitor isn’t satisfied with their answer then they can always still opt to contact you directly, but if implemented correctly a chatbot can conveniently provide them with the required information. This is just one example of the way AI will assist small businesses owners and allow you to focus on offering the most value to your website visitors as quickly possible. Changing your website’s design can sometimes be daunting as it’s what you and your visitors have come to know and hopefully love. However, a rule of business is that if you’re not changing and adapting to current trends then you will be left behind, because you can be sure your competition is. By following some of the trends we’ve mentioned here and employing features that suit your offering, you can be confident that your website stands out in 2018.